New Builds take a wide range of design, materials and building techniques and are ever changing. Likewise our survey templates are ever developing to include new building techniques, materials and styles along with any building issues or characteristics these incur/include. Our New Build survey templates include many unique survey sketches, photos and building definitions to ensure that our clients are fully informed and can make the best decision on their next property move. New Build Survey sketches are amongst the vast collection of survey sketches we have commissioned over the many years our Surveyors have been compiling survey reports. Each Era has its own building styles, characteristics and issues which are outlined in the building survey and enhanced by the inclusion of a unique survey sketch. 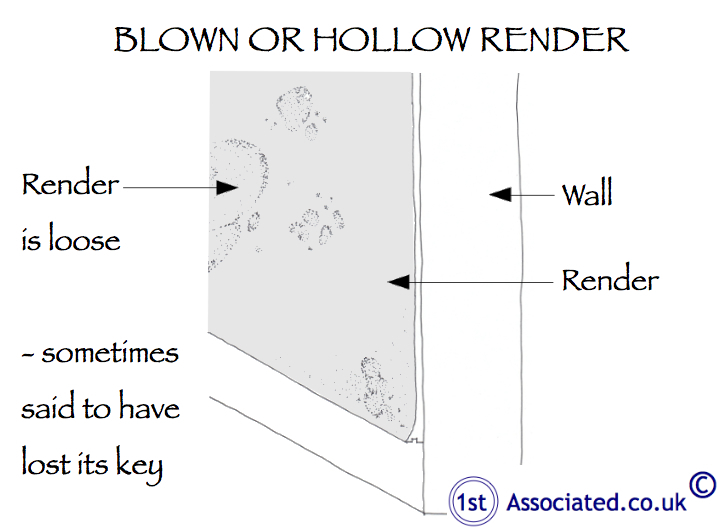 The adjacent sketch shows blown or hollow render which can be an issue not only on new builds but in older properties too.